For the 2016 documentary film, see Company Town (film). A company town is a place where practically all stores and housing are owned by the one company that is also the main employer. Company towns are often planned with a suite of amenities such as stores, churches, schools, markets and recreation facilities. They are usually bigger than a model village ("model" in the sense of an ideal to be emulated). Some company towns have had high ideals; but many have been regarded as controlling or exploitative. Others developed more or less in unplanned fashion, such as Summit Hill, Pennsylvania, United States, one of the oldest, which began as a LC&N Co. mining camp and mine site nine miles (14.5 km) from the nearest outside road. Traditional settings for company towns were where extractive industries — coal, metal mines, lumber — had established a monopoly franchise. Dam sites and war-industry camps founded other company towns. Since company stores often had a monopoly in company towns, it was often possible to pay in scrip through a truck system although not all company towns engaged in this particular practice. In the Soviet Union there were several cities of nuclear scientists (atomics) known as atomgrad; particularly in Ukraine those were Pripyat, Varash, Yuzhnoukrainsk among others. 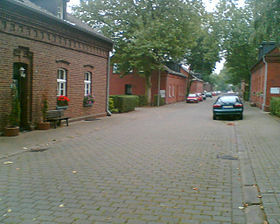 Typically, a company town is isolated from neighbors and centered on a large production factory, such as a lumber or steel mill or an automobile plant; and the citizens of the town either work in the factory, work in one of the smaller businesses, or is a family member of someone who does. The company may also donate a church building to a local congregation, operate parks, host cultural events such as concerts, and so on. If the owning company cuts back or goes out of business, the economic effect on the company town is devastating, as people move to jobs elsewhere. Company towns often become regular public cities and towns as they grow and attract other settlement, business enterprises, and public transportation and services infrastructure. Other times, a town may not officially be a company town, but it may be a town where the majority of citizens are employed by a single company, thus creating a similar situation to a company town (especially in regard to the town's economy). Further, such dependencies extend to neighborhoods and regions of larger cities. In each case, if the primary company falls on lean times, fails outright or the industry fades in importance (as with steam locomotive support rail yards and anthracite mining industries which depended on steam locomotives spurring demands) the communities contract and lose property value and then population as people move to find work elsewhere, and the youth of the community bears the children of their generation in another demographic region. Paternalism, a subtle form of social engineering, refers to the control of workers by their employers who sought to force middle-class ideals upon their working-class employees. Paternalism was considered by many nineteenth-century businessmen as a moral responsibility, or often a religious obligation, which would advance society whilst furthering their own business interests. Accordingly, the company town offered a unique opportunity to achieve such ends. Although many prominent examples of company towns portray their founders as "capitalists with a conscience", for example, George Cadbury's Bournville, if viewed cynically, the company town was often an economically viable ploy to attract and retain workers. Additionally, for-profit shops within company towns were usually owned by the company, which were unavoidable to its isolated workers, thus resulting in a monopoly for the owners. Although economically successful, company towns sometimes failed politically due to a lack of elected officials and municipally owned services. Accordingly, workers often had no say in local affairs and therefore, felt dictated to. Ultimately, this political climate caused resentment amongst workers and resulted in many residents eventually losing long-term affection for their towns; such was the case at Pullman. Although many small company towns existed in mining areas of Pennsylvania before the Civil War, one of the largest, and most substantial early company towns in the United States was Pullman, developed in the 1880s just outside the Chicago city limits. The town, entirely company-owned, provided housing, markets, a library, churches and entertainment for the 6,000 company employees and an equal number of dependents. Employees were required to live in Pullman, although cheaper rentals could be found in nearby communities. The town operated successfully until the economic panic of 1893, when demand for the company's products declined, and employee wages had to be lowered accordingly. Despite this, the company refused to lower rents in the town or the price of goods at its shops, thus resulting in the Pullman Strike of 1894. A national commission formed to investigate the causes of the strikes found that Pullman's paternalism was partly to blame and labelled it "un-American". The report condemned Pullman for refusing to negotiate and for the economic hardships he created for workers in the town of Pullman. "The aesthetic features are admired by visitors, but have little money value to employees, especially when they lack bread." The State of Illinois filed suit, and in 1898 the Supreme Court of Illinois forced the Pullman Company to divest ownership in the town, which was annexed to Chicago. However, government observers maintained that Pullman's principles were accurate, in that he provided his employees with a quality of life otherwise unattainable to them, but recognised that his excessive paternalism was inappropriate for a large-scale corporate economy and thus caused the town's downfall. Accordingly, government observers and social reformers alike saw the need for a balance between control and well-designed towns, concluding that a model company town would only succeed if independent professionals, acting as a buffer between employers and employees, took a role in conception, planning, and management of these towns. wanted to create a better life for their employees: decent housing, good schools, and a "morally uplifting" society. In return, they expected stable, hard-working employees who would eschew the evils of drink and, most important, not fall prey to the blandishments of union organizers. Thus, the Pullman Strike did not kill the concept of a company town but rather initiated a new chapter in their existence. Over the next thirty years, the old model of paternalism was abandoned in favour of new professionally designed company towns with architects, landscape architects, and planners translating "new concepts of industrial relations and social welfare into new physical forms". This suited capitalists of the day who were obviously keen to avoid the experiences of Pullman. The first real example of this occurred at Indian Hill-North Village, Massachusetts, in 1915. By the 1920s, the need for company towns had declined significantly due to increased national affluence. Despite income inequalities and a relatively low standard of living conditions amongst factory laborers, the prosperity of the 1920s saw workers’ material well-being improve significantly. A strong post-war American economy meant installment buying was accessible to low-wage earners who could now purchase previously unattainable goods like automobiles and radios. Moreover, workers were no longer dependent on employers for healthcare and education. Furthermore, the accessibility of the working class to private transport also marked a step of equality as they had previously only been accessible to the wealthy. As access to surrounding municipalities increased, residents of company towns gained access to an increasing amount of government-funded public resources such as schools, libraries, and parks. Accordingly, there was no longer a need for the amenities of company towns which, prior to welfare capitalism, had previously been unattainable to the working class. This new found freedom saw a change in the mindset of workers who began to look on welfare capitalism as demeaning rather than an incentive. Accordingly, many employees began to request additional pay in lieu of welfare programs. This was well received by some employers as the idea of ‘laissez-faire’ individualism, which promoted entrepreneurial virtues of hard-work being rewarded rather than direct charity, began to shape new-age paternalism. Modernization and the increase in material well-being had also lessened the perceived need for paternalism and moral reform. Consequently, the economic downturn of the early 1930s saw some businesses do away with employee welfare schemes to reduce costs. However, the Roosevelt Administration’s New Deal dealt the final blow to end American company towns by raising minimum wages, encouraging industrial self-governance, and pushing for the owners of company towns to “consider the question of plans for eventual employee ownership of homes”. To a lesser extent the New Deal also reduced the need for employee housing by transforming housing finance to a lower-interest, lower-deposit system making home ownership more accessible to the working class. During the late nineteenth century, model company towns materialised, as enlightened industrialists recognised that many poor workers were living in appalling conditions. These industrialists wished to combat the unsanitary and congested conditions common to working class districts in order to create better living conditions for workers. Model company towns such as Port Sunlight (1888) and Bournville (1895) were influential in regards to their building and planning innovation. The ideas generated from these model towns are regarded as having a significant influence on the Garden City movement. The model company town is concerned with creating a productive and prosperous company. Enlightened industrialists believed this could be achieved by providing a healthier residential environment for their employees. Planning a model company town involved the fusion of new notions of house design and layout. The paternalism of the enlightened industrialist was exhibited in his desire to provide an environment for his employees that was aesthetically appealing and which included well-designed residences, parks, schools, libraries and meeting halls. The industrialist also wished to contribute to his workers' well-being by providing social programs such as sporting events and functions. This, however, highlights the power and immense control possessed by the company owner, who could shape the lifestyle and activities of his employees to serve his own interests and those of the company. Model villages for agricultural workers were founded in the early 19th century in the United Kingdom. The creation of model company towns was particularly evident in Britain during the latter half of the nineteenth century with the creation of Saltaire (1851), Bournville, Port Sunlight, Creswell and New Earswick (1901) and coincided with the housing-reform movement, which emphasized the improvement of housing for the working class. These model towns contrasted with the overcrowded conditions in British working-class districts, which were often characterized by congested housing, unsanitary conditions, and poor provision of open space and facilities. Model company towns promoted the idea of orderly, planned town development as well as the notion of planning for the needs of the community in order to provide healthier living conditions. Model company towns around the mid-nineteenth century, such as Copley (1849), near Halifax, and Saltaire (1853), close to Bradford, were differentiated by improved dwellings for workers which contrasted with working-class housing in other industrial villages and cities. These model company towns prompted the creation of others, such as Port Sunlight, Bournville and Creswell, within an environment of reform. Port Sunlight (1888) in Cheshire was established by William Hesketh Lever (later Lord Leverhulme) of Lever Brothers – a soap and tallow manufacturer. The earlier layout of this model company town was planned to suit the undulating topography of the site. Port Sunlight catered for the Lever Brothers employees through the provision of improved housing (cottages of varying designs and materials) and gardens, as well as social and community facilities, including an auditorium, a school, tennis courts and bowling greens. Port Sunlight combined the use of formal and informal planning elements, such as straight streets close to the town centre and curved streets in the residential areas. This combination of the formal and informal represented a new feature of British town planning. Bournville (1895), near Birmingham, was established by the Cadbury brothers, George and Richard. George and Richard Cadbury chose to transfer the Cadbury factory to this new site in order to provide their employees with improved living conditions and a country environment that they could enjoy – a far cry from the busy, smoky city centre of Birmingham. The firm provided education in the form of a compulsory academic course, and workers were given the opportunity to complete commercial or technical training. The Cadburys also encouraged their workers to get involved in the social life of Bournville through the provision of sports facilities and athletic and cultural clubs, as well as social events such as summer parties. George Cadbury, a Quaker, preached Christian values, such as respectability, thrift and sobriety, and sought to unify the Bournville community through rituals such as gift giving between employer and employee. The firm also established work councils, such as the Women's Works Council, and supported trades unions. Bournville represented the union of industry and nature as the company town boasted the attractiveness of the countryside and low-density development defined by well-built and visually appealing dwellings. Unlike Port Sunlight, Bournville catered for a mixed community, where residences were not restricted to the workforce only. Bournville illustrated how, towards the end of the nineteenth century, low-density development was being punctuated along with the provision of open air, space and sunlight. Bournville's gardens, parks, tree-lined streets, sense of spaciousness and country setting enhanced its aesthetic appeal and demonstrated George Cadbury's endeavour to provide workers with a healthy, beautiful and well-ventilated environment. The Bolsover Company developed two exemplary mining communities in Derbyshire during the late nineteenth century, Bolsover (1891) and Creswell (1896). The Bolsover Company aimed to provide improved living conditions for the miners and their families in these model industrial villages. The houses at Creswell were built in concentric circles, and within these circles was a large open parkland and a bandstand. Not only did the Bolsover Company aim to provide better housing, but they also wished to improve workers' moral fibre, believing that the provision of facilities and the promotion of workers' welfare would discourage drunkenness, gambling and bad language. The Bolsover Company provided facilities deemed beneficial for employees at both villages including clubhouses, bowling greens, cooperative society stores, cricket pitches and schools. During the early years of these model industrial villages, the Bolsover Company organized various events intended to enhance community life, such as flower shows, lectures, sporting events, concerts, teas and dances. Catalonia, a region located in North-Eastern Spain, has a high density of company towns, known locally as industrial colonies. They are especially concentrated in river basins along the Ter and Llobregat. In Berguedà, for example, within 20 km there are 14 colonies. The total number in Catalonia is around a hundred. These were small towns created around a factory, built in a rural area and, therefore, separate from any other population. They housed between 100 and 500 inhabitants, and in some cases around 1000 people. These industrial colonies were a typical aspect of industrialization in Catalonia, specifically the second industrialization, which resulted in certain areas that were once purely rural becoming industrial. They were first created in the second half of the nineteenth century, especially from the 1870s onwards. The last colonies were created in the early years of the twentieth century. Thus, company towns in Catalonia have a history going back some 150 years, although in almost all cases the company that operated the colony has now shut down. The most common industry in these colonies was textiles. There are more than 75 textile colonies recorded; although there were also mining, metallurgy and agricultural colonies. Mostly these colonies (particularly the textile related ones) were constructed close to a river. This was because they used hydraulic power (waterwheels) to run the factory. One reason for this was that Catalonia was poor in coal and importing it was expensive. In addition, the Catalan rivers (with little volume but a very steep sloping run) provided free and almost inexhaustible energy, that was lacking only in times of drought. The industrial colonies system began to collapse in the 1960s. The colonies gradually emptied of people even before the definitive industrial crisis, which worsened in 1978. In the 1980s and 1990s almost all the factories in these industrial colonies closed. From that moment on, many colonies became towns that were now independent of the company, others were abandoned and remain without inhabitants. Other factories were leased to smaller industries or now lie empty. Some of the more interesting colonies include: Colònia Güell, in Santa Coloma de Cervelló, which contains several modernist buildings, such as the crypt church built by Antoni Gaudí; L'Ametlla de Merola, Puig-reig, where centenary traditional cultural activities are held, such as the representation of Els Pastorets; the three colonies of Castellbell i el Vilar: La Bauma, El Borràs, El Burés, with buildings of architectural interest; Cal Rosal, between Berga, Avià and Olvan, which, in 1858, was the first colony in the era of building large colonies in the Llobregat; Cal Vidal, Puig-reig, which houses the Museum of the Vidal Colony, an ideal visit for anyone wishing to learn what life was like in one of these industrial experiments. Fordlândia was established by American industrialist Henry Ford in 1928 as a prefabricated industrial town in the Amazon rainforest of Brazil. Intended to be inhabited by 10 thousand people, it failed; and the city was abandoned in 1934. Kuusankoski in Finland, formerly also known as "the paper capital of Finland", is a prime example of the decline many company towns have had to deal with when the company itself struggles. The town relied on three paper mills owned by Kymmene Corporation from the 1870s until 2005 when two mills, Voikkaa and Kuusaa, were shut down, leaving only the Kymi mill operating. An estimated 5% of the local population had been employed by the two closed mills and Kymmene's decision left the town in socioeconomic chaos. Kuusankoski's independent status ended in 2009 when the town was consolidated into the regional capital, Kouvola. The French city of Le Creusot is a company town. The German cities of Ludwigshafen, Wolfsburg and Leverkusen are company towns. The Japanese city of Kitakyushu is a company town. The border town Oranjemund, Namibia is a company town owned by Namibian DeBeers (Namdeb). The town has a diamond mine that was established over 25 years ago and is still ongoing till this day. Residents of Oranjemund either work in the mine or for the company in offices based in the town. To enter the town, all people above 18 need permission to pass its gates and need to provide a residential, and reason for visiting. Due to this the town has no homeless people at all and can regulate people coming in and out of the town. A municipality has recently been introduced in Oranjemund and will start to fully operate in late 2016 meaning residents will soon start paying for Water and Electricity which has been a benefit to them. The town is staged and is busy readying itself to becoming open to the public. Widzew, a suburb of Łódź in Poland, had been a textile company town before the Second World War. Svit in Slovakia was founded in 1934 by business industrialist Jan Antonín Baťa in accordance with his policy of establishing well-organized model communities for his workers and other employees. This town (like other Baťa´s company towns) was also an example of social engineering. The mining city of Kiruna in Sweden was originally, around 1900, built by the mining company in an unpopulated area. Everything, including the church, was built by the company. The city of Pripyat in Ukraine was established in 1970 solely to house the workers at the adjacent Chernobyl Nuclear Power Plant and their families. It was one of several "nuclear cities" constructed by Soviet nuclear power firms throughout the latter half of the 20th century. All amenities, stores, and employment was conducted through each nuclear city's power plant administration. Coalwood, West Virginia is a company town as portrayed in the movie October Sky. At their peak there were more than 2,500 company towns, housing 3% of the US population. The companies that ran the towns were primarily labor companies such as coal, steel, lumber and various war industries. Most of the people living in these towns were immigrants new to the country. This could cause issues among the populace since the manager of the town would be in charge of establishing the town's religion. Segundo, Colorado, was a company town where the CF&I coal company housed its workers. It offered adequate housing and promoted upward mobility through its sponsorship of a YMCA Center, an elementary school, and some small businesses, as well as a company store. However, air pollution was a constant health threat, also the houses lacked indoor plumbing. As demand for metallurgical coke declined, the mine laid off workers, and Segundo's population declined. After a major fire in 1929, CF&I left town, and Segundo became practically a ghost town. One famous company town was McDonald, Ohio, which was created by the Carnegie Steel Company to house and serve the needs of its employees in the Youngstown, Ohio, area. Marktown, Clayton Mark's planned worker community, was an example in northwest Indiana. In the present-day United States, it is relatively rare for any place in which a single company owns all the property to be granted status as an incorporated municipality. Rather, companies will normally prefer their wholly owned communities to remain unincorporated, as this permits administration of the community to be carried out by appointed company officers rather than elected officials. However, there are incorporated municipalities that are heavily dependent upon a single industry or organization and may be loosely considered a "company town", even though the company does not technically own the town. Look up company town in Wiktionary, the free dictionary. ^ Arthur Melville Pearson (January–February 2009). "Utopia Derailed". Archaeology. 62 (1): 46–49. ISSN 0003-8113. Retrieved 2010-09-15. ^ Linda Carlson, Company towns of the Pacific Northwest (U. of Washington Press, 2014) p. 190. ^ a b Parsons, K.C. ; Garner, John S. (1985). "Review of the model company town: Urban design through private enterprise in nineteenth-century New England". The New England Quarterly. 58 (4): 639–643. doi:10.2307/365575. ^ a b c Serra, Rosa (2011). "Industrial colonies in Catalonia". Catalan Historical Review. 4: 101–120. doi:10.2436/20.1000.01.53. ISSN 2013-407X. Retrieved 27 April 2016. ^ Clua i Mercadal, Jordi (1992). "Les colònies industrials al Berguedà: estudi d'una transformació econòmica i urbana". Treballs de la Societat Catalana de Geografia (in Catalan). VII: 145–170. Retrieved 3 May 2016. ^ "Monuments to power". The Economist. 2010-10-14. Retrieved 2010-10-19. At their height there were more than 2,500 such towns housing 3% of the population. ^ Weaver Glen D., Graham Ryan C. (2008). "Segundo, Colorado". New Mexico Historical Review. 83 (3): 323–351. ^ "It Was a Company Town. Now It's a Confident Town". Business Journal Daily. Retrieved 2017-10-16. ^ Smith, S. & Mark, S. (2011). Marktown: Clayton Mark's Planned Worker Community in Northwest Indiana Archived September 13, 2012, at the Wayback Machine. South Shore Journal, 4. ^ "Scotia Community Governance News". The town of Scotia, California. Retrieved 7 January 2019. Dellheim, C. (1987). "The creation of company culture: Cadburys, 1861–1931". The American Historical Review. 92 (1): 13–44. doi:10.2307/1862781. PMID 11612055. Gaskell, M. (1979). "Model industrial villages in S. Yorkshire/N. Derbyshire and the early town planning movement". The Town Planning Review. 50: 437–458. doi:10.3828/tpr.50.4.c68854037r676528. Hebblethwaite, R. (1987). "The municipal housing programme in Sheffield before 1914". Architectural History. 30: 143–179. doi:10.2307/1568518. Crawford, M (1995). Building the Workingman's Paradise: The Design of American Company Towns. London & New York: Verso. ISBN 0-86091-695-2.